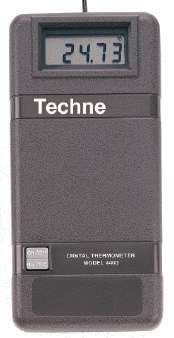 Techne hand-held Model 4400 Series Ultra-High Accuracy Thermometers take metrology-level temperature measurement to the laboratory, the production floor, and the field. Ultra-high thermometer accuracy up to Â±0.015Â°C is achieved because the thermometer uses extremely stable components and circuitry. Each thermometer is electronically calibrated, maintaining excellent repeatability. The 4400 System uses coefficients for the Probes with the Stienhart-Hart algorithm to calculate the exact temperature reading every time you plug in a probe to take a measurement. The 4400 series thermometers are configured and hardwired to the specified probe and calibrated as a system for high accuracy. When one type of probe will do the job a hardwired system offers excellent repeatability with ultra high accuracy over a wider range.